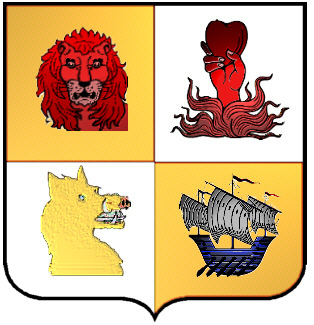 Shield quartered, 1st & 4th gold with lion and sailing vessel, 2nd & 3rd white with hand holding heart and a boar's head. The Red Lion represents dauntless courage, its red color represents a warrior, brave, strong, generous and just. The Red hand signifies sincerity, faith, and judgment, the heart signifies clarity and sincerity. The Blue Gally is a traveler to far off places, a naval commander. The Gold Boar's head signifies hospitality, a boar stands for bravery, one who fights to the death. The gold color depicts generosity and elevation of mind. Motto: Touch not the cat without a glove. 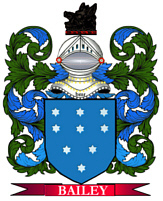 The McIntosh clan is tracable to Shaw McDuff in about 1160. McDuff, who took the name McIntosh, was awarded lands in Inverness for his support of Malcom IV in opposing a rebellion. McINTOSH. A mailing list for the discussion and sharing of information regarding the McIntosh surname and variations in any place and at any time. To subscribe send "subscribe" to mcintosh-l-request@rootsweb.com (mail mode) or mcintosh-d-request@rootsweb.com (digest mode).